With the very justification of the remaining Ranger flights now called into question, the future of the project hung by the most tenuous of threads. Should it be canceled or completed in 1964? The answer to that question depended upon another investigation of the project by JPL and NASA officials, and upon the response from Congress (Figure 79). On Sunday morning, a few hours after the impact of Ranger 6, William Pickering appointed a JPL-RCA board of inquiry to investigate the malfunction of the television system. Television project engineer Donald Kindt, placed in charge, was directed to find the cause of the failure and recommend action to prevent its recurrence on Ranger 7. The next day, on February 3, 1964, Pickering appointed a second investigative body composed of JPL section chiefs and chaired by the "voice of Ranger 6," Walter Downhower. This group was to check on the "completeness" of the Kindt-led project investigation and act as "a review board to evaluate [its] conclusions and recommendations." 4 Pickering expected to have the findings and recommendations in time to modify Ranger 7 before its scheduled launch at the end of February. The JPL investigation began auspiciously, with words of encouragement from Representative Joseph Karth, the subcommittee chairman of the House Committee on Science and Astronautics, who commented to reporters that it seemed reasonable for the project to continue. If only two of the three remaining Rangers were successful, he said, the effort would be "worth the money and time spent on it." Committee Chairman and California Democrat George P. Miller sent a personal note to Pickering reaffirming faith in NASA and JPL, and offering his opinion that the performance of Ranger 6 and the accuracy of its flight path truly had made that mission "an accomplishment of the first order." 5 To be sure, both men had become closely associated with and approved funds for Ranger over the years. With Laboratory morale at its nadir, the Congressional encouragement was most welcome. Kindt and the JPL investigators quickly isolated the time of the failure: the sixty-seven seconds when the television telemetry had unaccountably turned on during ascent through the earth’s upper atmosphere. Electrical arcing in that critical pressure region, * they determined, had destroyed the high-voltage power supplies to the television cameras and their transmitters. But what caused it, and the enigmatic cessation and subsequent normal operation of the television telemetry on the way to the moon, defied simple explanation. Opinion at JPL was divided over several possible causes and, consequently, over what remedial action to take. * Gaseous breakdown to a state of electrical conduction occurs most readily at the densities and pressures prevailing in the upper atmosphere. 3. Modify the Ranger television telemetry to transmit data on system performance during the warmup period near the moon. 4. Conformally coat all exposed terminals in the television system, and pot or sleeve any exposed connector pins to minimize the possibility of an accidental short. 5. Perform a pin retention test on all connectors. The investigative report and its technical recommendations, approved by Downhower’s watchdog group, were then turned over to the NASA board of inquiry that would make the final recommendations for Ranger’s future. A self-made 43-year-old executive, Hilburn had acquired a reputation as an effective manager in industry, most recently as vice-president and general manager of the Electronics Division of the Curtiss-Wright Corporation. Seamans had picked Hilburn to consolidate and oversee NASA procurement policies and practices, particularly to encourage the use of incentive contracts instead of the cost-plus-fixed-fee type. Almost immediately after Hilburn had joined NASA six months earlier, 12 Webb assigned him the task of reviewing the contractual relationship between Caltech, JPL, and NASA. The prevailing contract reflected JPL tradition, which was to operate rather independently of its governmental sponsor under the academically managerial protection of Caltech. Hilburn recommended including a number of terms in a new contract to tighten NASA’s control over the Laboratory and, with Webb’s backing, forced most of them through against vigorous objections from Caltech and JPL. Now Hilburn, something of a bête noire at the Laboratory, was to command NASA’s evaluation of Ranger 6, much to the dissatisfaction of the scientists and engineers in Pasadena (Figure 80). The NASA Headquarters review board - shortly to become known as the "Hilburn Board" - convened on Thursday, February 6, in Washington. The next day the board members met in Pasadena, and began one week of evaluating and discussing JPL’s Ranger 6 findings and recommendations. Hilburn, a manager before he was a technician, soon found himself deeply troubled by the various explanations under debate at JPL. The absence of a single "definitive cause" of the television failure suggested to him that more than a simple technical problem was involved. If JPL project and division personnel had overlooked a marginal design - indeed a design flaw - in the umbilical connector on the Agena nose fairing, might not other parts of the RCA television system and the JPL spacecraft likewise be impaired? Project Manager Schurmeier and his JPL associates remained convinced that the electrical arcing, triggered by a single unknown event, had "cascaded" in the low pressure and density of the upper atmosphere so as to bum up the television high-voltage power leads. But was it not just as reasonable to suppose that two or more discrete failures resulting from design and testing deficiencies had occurred nearly simultaneously? On February 14, the day that JPL investigators issued their final report, the members of the NASA Ranger 6 Review Board presented their preliminary findings and recommendations to officials of the space agency in Washington. Deputy Administrator Hugh Dryden and Deputy Associate Administrator Walter Lingle, along with Newell, Nicks, Cortright, Cunningham, and Jakobowski, listened intently to the presentation. The board, Hilburn reported, had uncovered numerous deficiencies in the design and testing of the "split" television system used in the Ranger Block III vehicles. This system was not entirely redundant, he observed, having been hastily redesigned after the flight of Ranger 5. These television systems also had recorded instances of inadvertent turn-ons at RCA during tests. The Ranger 6 television system, furthermore, had not been checked out at full power on the pad just prior to launch. The test history of the Ranger spacecraft appeared hardly better. Torsional vibration of the spacecraft and television system at JPL had been conducted with the proof test models but not with the flight articles. JPL also preferred to conduct mission tests using numerous hard wires to monitor the performance of the spacecraft subsystems, another example, he continued, of procedures that in the board’s opinion jeopardized a thorough understanding of how the vehicle would perform in space. 13 These conditions, along with the lack of any telemetry data that pinpointed the failure, led the board to conclude that more than one cause was responsible for the loss of the Ranger 6 television system. A quick technical fix, such as JPL’s proposal for electrically "locking out" the television system during ascent through the atmosphere, would therefore be insufficient to guarantee success. Ranger, the board said, would have a very low chance of achieving its objectives if NASA were to follow that course; much more stringent measures were necessary. The RCA television system, the Hilbum group concluded, had to be redesigned and retested, with a delay of twelve months or more before the next flight. Moreover, the board wished to broaden its investigation at JPL to include an evaluation of the JPL spacecraft, with further recommendations to follow. 1. The Ranger 7 television system would be modified, reworked, and retested at the RCA plant in Hightstown, New Jersey, while the spacecraft remained at Cape Kennedy. 2. A proof test model of the modified television system would be requalified, then returned to JPL for further tests. 3. Changes to the spacecraft would be limited to the wiring necessary to accommodate the modified television system. Both the flight spacecraft and television system would be retested at the Cape. 2. Hazardous conditions resulted from certain practices employed in the design and construction of the spacecraft. These included the use of a male umbilical connector, a multiplicity of circuits through the umbilical, exposed terminals where a foreign particle could produce a short circuit, and the use of unvented and unsealed boxes. 3. Most of the Ranger testing was carried out in such a manner that potentially dangerous situations which could have enhanced accidental triggering of critical control circuits could not be vigorously assessed. Because of approximately 300 wire electrical connections between the operating circuitry of the Ranger spacecraft and its associated external test equipment, the ground test conditions are quite apart from the true space flight conditions, where only radio communications tie the spacecraft to its ground control systems. 4. The Ranger 6 spacecraft contained a directional antenna ... that was never system tested with the high-power TV transmitters. 5. Prelaunch systems verification was incomplete (e.g., the last operation of the complete TV subsystem on Ranger 6 was twelve days prior to launch). This resulted from the necessity for removing the TV payload from the bus to fuel the midcourse motor, and the Jet Propulsion Laboratory's reluctance to risk possible damage to the space vehicle after it was reassembled, with the [pyrotechnic] squibs in place under the shroud. Project officials at JPL and Headquarters had conceded only portions of the second finding (one actually associated with the television subsystem and not, as claimed, with the spacecraft). The rest of the findings, which concerned JPL design and test philosophies, they had rejected. In substance and wording, those findings strongly implied an oversight at NASA, malfeasance at JPL, or both. The JPL staff had dissented with particular sharpness from the board's recommendations for corrective action to modify and retest Ranger 7. 1. Eliminate all ground wire connections during vibration testing, and use "absolute minimum wires" during mission testing. 2. Eliminate "microinspection" of certain components after environmental tests (JPL had agreed to do so only for Ranger 7). 3. Use minimum wires during prelaunch checkout. James Webb received the final report but took no immediate action. The disquisition posed disrupting procedural problems. On the one hand the news media and the Congress expected word of the investigation’s results and of NASA’s plans for Ranger. On the other hand public release of the report was liable to stir a massive wave of contention within the space agency. On March 26 Robert Seamans sent copies of the Hilburn final report to Pickering, DuBridge, and the inventor, businessman, and chairman of the Caltech Board of Trustees, Arnold O. Beckman. The classified report, Seamans explained in his covering letter, was an "internal document not for public distribution or discussion with the press..." Access was being limited to the three men while "we ... consider very carefully what our responsibility is with respect to reporting to the Congressional Committees ... and to the press." 21 Under the terms of transmittal, the document could not be shown to other JPL officials. But however the letters were intended, members of Newell’s office worried about Congressional demands for an investigation of Ranger based on the debatable charges. In Pasadena, the letters sharply increased exasperation over the seeming byzantine maneuvers of NASA Headquarters in its dealing with Caltech-JPL. Copies of Webb’s letters arrived in the Office of Space Science and Applications the same day that they were posted to Capitol Hill. No one had been prepared for them; indeed, it seemed inconceivable that letters containing the Hilburn Board charges could have been sent forward without prior consultation, or the chance to append documents of rebuttal. 23 It appeared as if Webb’s office had made a grievous administrative error or, worse, the Administrator had lost all confidence in those at NASA responsible for Project Ranger. Morale plummeted. 1. The two RCA video chains might have been complex, but the Hilburn report implied that any system not entirely redundant was improperly designed. "Even if the two TV channels had been completely redundant, the spacecraft itself would have represented a non-redundant series of systems of far greater complexity... A single failure in the attitude control system, for example, could result in complete loss of television data, as could the failure of a booster engine." 2. The report’s description of practices employed in the design and construction of the spacecraft conveyed "no other conclusion than that the spacecraft was assembled with complete disregard for normal quality control practices..." For example, "the method and degree of venting unpressurized [electronic] boxes will always be a matter of engineering judgment. Insofar as the Ranger flights are concerned, we have never encountered a problem attributed to venting." 3. JPL’s use of wire electrical connections during spacecraft testing was also a matter of judgment Ranger communicated over great distances on a wideband radio-frequency link which limited the telemetry bit rate. therefore, "because of this lack of capability to adequately monitor ... the spacecraft with the RF link, cables are required during environmental tests." Care nonetheless had been taken to check for sneak circuits in the ground equipment which might have caused or obscured failures during testing. 4. The Ranger 6 directional antenna was "not normally used during ‘system tests;’ " however, it was "a simple, fixed geometry, 1.2-meter (4 foot) dish which is always functionally tested after installation to ensure that it is transmitting properly, and video is transmitted by means of this antenna with the spacecraft in launch configuration on the launch vehicle." It was not radiated at full power within the shroud atop the Agena for fear of damage to the spacecraft and launch vehicle. The Hilburn report, to be sure, did contain a number of charges based upon inconclusive evidence and erroneous technical assumptions. No one could be sure, for example, that "two or more failures must have occurred" aboard Ranger 6. And, because of the limited engineering data available from Ranger’s analog telemetry, the hard wire electrical connections that JPL used between the spacecraft and its external ground test equipment really made technical sense. The board members knew along with everyone else that something catastrophic had gone wrong, though whether it involved the spacecraft as well as the television subsystem and the umbilical connector on the Agena nose fairing remained a question mark. But it was also true that more spacecraft testing, including full-power television tests without wire connections to the test consoles, could have been accomplished as a doublecheck, and NASA and JPL officials had to consider it. A draft of Nicks’ rebuttal to the Hilburn charges was shown to Robert Seamans. Since Congress had already received the findings, he considered formal criticism sensitive at this point. "We were authorized to put it in the files," Cortright later recalled, "but not to send it." 26 Seamans, in turn, took up the issue with Webb. Leaders of the Office of Space Science and Applications, Webb learned, would likely take issue with various aspects of the Ranger 6 findings in any Congressional investigation. And so, it seemed, they would. The Hilburn report, Nicks informed Newell bitterly, not only contained inaccuracies, but, since it contained no military secrets, it had also been classified in a highly irregular fashion. "Allowing only limited distribution, such as preventing the Director of JPL from showing the report to his staff, indicates clearly that NASA did not establish the review board for the purpose of feedback to project personnel." If the only purpose of the investigation had been to establish "a basis for a critical letter to Congress," Nicks concluded, "we in the Program Office were naively misled initially into supporting it as a constructive endeavor." 27 At JPL, where the report itself had been viewed as a final canard from Hilbum, the NASA investigation, the report and the letters to Congress now appeared connected in a devious attempt to bludgeon the Laboratory’s management. 28 Exasperation gave way to outrage. Pickering instructed JPL officials to refuse interviews with newsmen and issue no public statements. The focus of the managerial issue was the responsiveness - or what Karth suspected as the lack of responsiveness - of JPL to the direction of NASA. Pickering flatly declared that, while JPL felt free to dispute NASA technical and organizational judgments, the Laboratory always accepted ultimate decisions and directions from Headquarters. The problem was to remain responsive to Washington while maintaining the spirit of free inquiry characteristic of a university laboratory. In fact, the new NASA - Caltech contract, Pickering explained, permitted NASA increased control over JPL. 37 "It would be quite unwise," Webb added in support of Pickering's observation, for subcommittee members "to start out on an effort to convert this into a civil service laboratory..." NASA and Congress must never "forget that a very, very large proportion of [JPL’s] work is entirely satisfactorily handled-in fact, is outstandingly handled - and that there are men there who have done and are doing work more technical more complex, more difficult than is being done in almost any other place by the human race." 38 The latest contract with Caltech, he assured the legislators, afforded the space agency all the controls and authority it needed. To Webb’s mind, there were no scapegoats. There was a lunar flight project at JPL still to be completed successfully. At this stage in the nation’s evolving space program, furthermore, he had little choice but to back the Caltech-operated laboratory. He also had no reason not to, considering the JPL concessions: greater control from NASA, a new general manager, acceptance of more spacecraft testing, and greater attention to the RCA television system. Now it remained to be seen how the Laboratory and NASA would fare with Ranger 7. 1. The views and lifespan of this contemporary aerospace journal coincided neatly with the most competitive "cold war" period in astronautics. For Coughlin's views, see "The Rise and Fall, " Missiles and Rockets, May 2 5, 1964, p. 70. 2. William J. Coughlin, "A $150-million Failure," Missiles and Rockets, February 10, 1964, p. 50. Coughlin's source for the performance rating was apparently drawn from NASA Associate Administrator Robert Seamans, who had observed in testimony before Congress on February 4 that " the last Ranger flight was extremely successful from the standpoint of the guidance technology, but as we score this, it was a 100-percent failure. So we are," he assured the legislators, "scoring hard. "United States Congress, House, Committee on Science and Astronautics, 1965 NASA Authorization, Hearings before the Committee, 88th Congress, 2nd Session, on H.R. 964 1, 1964, No. 1, Part 1, p. 62. 3. Cf, remarks of Apollo Spacecraft Program Director Joseph F. Shea quoted from a speech in Milwaukee on February 3, 1964, in Harry S. Pease, "Sending Men to Moon in 196 8 Forecast, " Milwaukee Journal, February 4, 1964; and of John W. Eggleston, an Apollo space environmental specialist, in "Extra Apollo Moonshot Proposed," Associated Press Article, Brooks Air Force Base, Texas, February 6, 1964, cited in JPL News Clips, prepared by the Office of Public Information, February 7, 1964, p. 5. Other NASA officials moved swiftly to deny the veracity of these reports, TWX from Julian Scheer to William Pickering, February 6, 1964 (2-150), and a letter from Robert Gilruth to William Pickering, February 13, 1964 (2-1820); but the statements and subsequent refutations bespoke the low circumstances into which Ranger had fallen. 4. JPL Interoffice Memo 313-1398 from Walter Downhower to Donald Kindt, subject: "Committee of Section Chiefs Reviewing RA-6 Flight," February 12, 1964 (2-2078). 5. Karth quoted in "Legislators Back NASA on Ranger," Aviation Week and Space Technology, Vol. 80, February 10, 1964, p. 24; and letter from George Miller to William Pickering, February 5, 1964 (2-1813). 6. TWX from William Pickering to Homer Newell, February 11, 1964 (215 1 ); TWX from William Cunningham to Harris Schurmeier, February 17, 1964 (2-1826). 7. RA-6 Investigation Committee Final Report (Engineering Planning Document No. 205. Pasadena, California: Jet Propulsion Laboratory, California Institute of Technology, February 14, 1964)(2-1303). 9. Condensed from ibid., pp. 1-2 and 1-3. 10. NASA Announcement No. 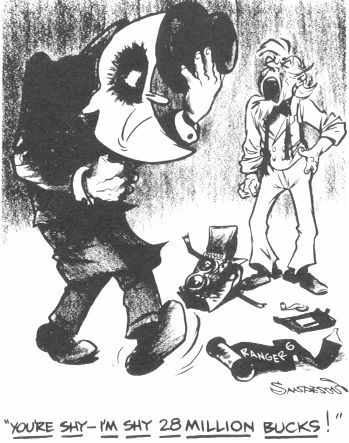 64-27 by Robert Seamans, subject: " Establishment of the Ranger VI Review Board," February 3, 1964 (2-1811). 11. NASA memorandum from Robert Seamans to Earl Hilburn, subject: "Clarification of Ranger VI Review Board Membership established February 3, 1964," n.d. (2-2468); and NASA memorandum from Robert Seamans to Earl Hilburn, subject: "Ranger VI Review Board," February 3, 1964 (2-2467). 12. NASA News Release No. 63-141, subject: "Three New Appointments to Headquarters Staff, " June 27, 1963 (2-2504). 13. See "Preparing for the Test Flights" in Chapter Four of this volume. 14. Meeting events as described in NASA memorandum from Walter Jakobowski to Homer Newell and Edgar Cortright, subject: "Comments on Ranger Failure Review Board Presentation on February 14, " n.d. (2-1823); and NASA memorandum from William Cunningham to Homer Newell and Edgar Cortright, subject: " Ranger VI Failure Report Presentation of February 14," February 18, 1964 (2-2469i); also TWX from Cunningham to Schurmeier, February 17, 1964 (2-1826). 15. NASA memo from Jakobowski to Newell and Cortright, n.d., pp. 1-2 (2- 1823). 16. NASA memo from Cunningham to Newell and Cortright, February 18, 1964, p. 2 (2-2469i). 17. 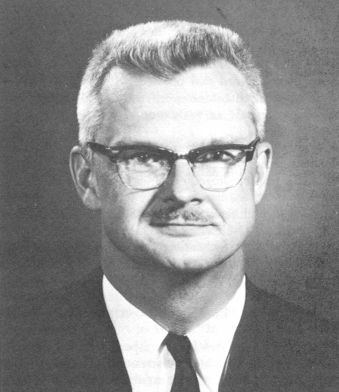 William Cunningham, NASA, OSSA Review, February 24,1964, pp. 49-50 (2-1505). 18. TWX from Homer Newell to William Pickering, February 24, 1964 (2-1828). 19. Final Report of the Ranger 6 Review Board (Washington: National Aeronautics and Space Administration, March 17, 1964), pp. 6-8 (2-2472). 21. Letter from Robert Seamans to William Pickering, March 26, 1964 (2- 2346). 22. Letter from James Webb to George Miller and Clinton Anderson, March 31, 1964, as reprinted in United States Congress, House, Committee on Science and Astronautics, Investigation of Project Ranger Hearings before the Subcommittee on NASA Oversight, 88th Congress, 2nd Session, 1964, No. 3, pp. 12-15. 23. Interview of Oran Nicks by Cargill Hall, August 26, 1968, p. 7 (2-761). 24. Draft of a NASA memorandum from Oran Nicks to Robert Seamans, subject: "Comments on Mr. Webb's Letter to Congress Regarding the Ranger Program," p. 1 (2-1844). 25. Condensed from ibid., pp. 2-9 of Attachment A; cf, Hilburn Board findings, "A Public Accounting," in this chapter, and JPL rationale, "The Aftermath, " in Chapter Six of this volume. 26. Interview of Edgar Cortright by Cargill Hall and Eugene Emme, March 4, 1968, p. 12 (2-762). 27. NASA memorandum from Oran Nicks to Homer Newell and Edgar Cortright, subject: "Ranger 6 Review Board, "April 9, 1964, pp. 1-2 (2395). 28. As Pickering later confided to Newell, "It would appear that the Board was all too eager to rationalize a reason for extending its efforts into areas that otherwise could not be related to the specific Ranger 6 failure, and thus impose its opinions and prejudices upon the overall conduct of the Project." Letter from William Pickering to Homer Newell, May 22, 1964, p. 3 (22469c). 29. JPL's Last Chance to Hit the Moon," Los Angeles Herald-Examiner, April 4, 1964. 30. "NASA Renews the Attack on JPL, " editorial in Los Angeles Times, April 8, 1964, Part II, p. 4. 31. NASA News Release, text of the conference by James E. Webb, April 15, 1964, p. 20 (2-1972). 32. Miller quoted in Bill Sumner, "House Will Probe JPL Controversy," Star News [Pasadena], April 9, 1964, p. 1; also Robert Toth, "House Unit to Probe NASA, Jet Lab Dispute," Los Angeles Times, April 10, 1964, Part 1, P.1. 33. See, for example, the Karth-Newell colloquy in United States Congress, House, Committee on Science and Astronautics, 1965 NASA Authorization, Hearings before the Subcommittee on Space Sciences and Applications, 88th Congress, 2nd Session,. on H.R. 9641, 1964, No. 1, Part 3, pp. 1965-1966; and United States Congress, Senate, Committee on Aeronautical and Space Sciences, NASA Authorization for Fiscal Year 1965, Hearings before the Committee, 88th Congress, 2nd Session, on S. 2446, 1964, Part 2: Program Detail," p. 591. After the Ranger 6 failure, Newell's longtime deputy Cortright asserted, "there was Congressional pressure to get rid of JPL, to reorganize JPL, take JPL over, all the things that we were considering [earlier] were suggested by Congress, some of it informally. Congressman Karth made suggestions like this to us privately." Interview of Cortright, by Hall and Emme, March 4, 1968, p. 16 (2-762). See Karth background, "Making a Case for More Rangers" and "Lunar Orbiter and Congress Intervene " in Chapter Thirteen of this volume. 34. Letter from James Webb to Joseph Karth, April 23, 1964, pp. 1-2 (2-2479). 35. Investigation of Project Ranger, pp. 1, 3. 40. United States Congress, House, Committee on Science and Astronautics, Project Ranger, Report of the Subcommittee on NASA Oversight, 88th Congress, 2nd Session, 1964, pp. 20-31. 41. Eventually set to extend three years, from January 1, 1964, through December 31, 1966. The previous extension had been for two years: January 1, 1962, through December 31, 1963. 42. JPL Press Release 2 94, June 2 9, 1964; " JPL Deputy Named, " Missiles and Rockets, Vol. 15, July 6, 1964, p. 8; JPL Announcement 8-64, August 11, 1964. 43. William J. Coughlin, " Praise for Caesar, " editorial in Missiles and Rockets, May 11, 1964, p. 46. 44. "Ranger: Oversight Subcommittee Asks Why NASA Doesn't Prevail on JPL to ‘Rigidize’ Projectwise," Science, Vol. 144, May 15, 1964, p. 824. 45. Letter from James Webb to George Miller, May 4, 1964 (2-2349).